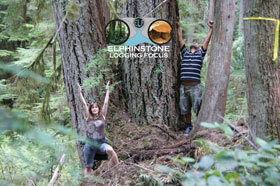 Elphinstone Logging Focus Society (ELF), is a non-profit, B.C. based environmental group providing information to the public on proposed logging in important forest lands. The organization’s mission is to ‘Protect Key Forests and Habitat’ in order to conserve ecosystems and support recreation, tourism and community enjoyment. ELF examines the forest industry’s 5 year plans for due diligence covering wildlife, archaeological, recreational, and hydrological assessments. By conducting field studies prior to logging, we can be pro-active in achieving our goals. Our foremost goal is to protect provincial forests for their long-term ecological functioning. Since older forests (250+ years) have evolved to be a fundamental part of the earth’s life-support system a large percentage (up to 30%) needs protection. Intact forests provide many key services including, oxygen production, slope stability, water quality & flow control, fish and wildlife habitat, gene pool, carbon sequestering, wild-crafting, recreation/tourism and spiritual nourishment. ELF is not opposed to ‘harvesting’ of second growth forests using partial-cut techniques, however is opposed to industrial style logging and seeks a ban on clear-cut logging since it destroys eco-sytems. We believe that short term logging revenues pale in comparison to the longer term environmental services that old-growth forests generate for present and future generations.